Eating these unpredictable tapas is a game of spicy-pepper roulette. 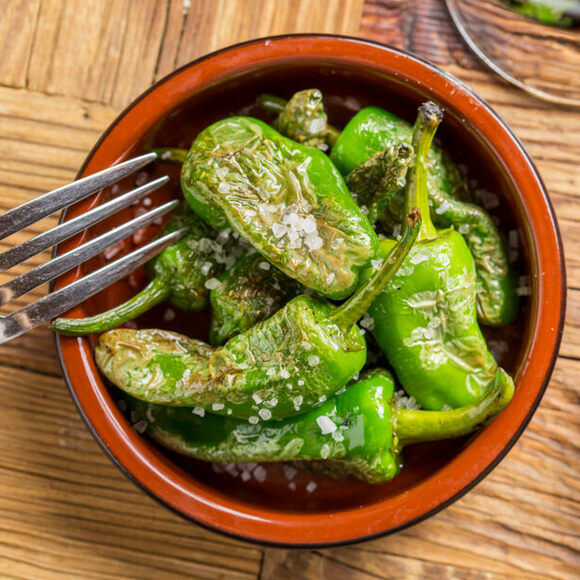 There’s an expression in Spanish: Los pimientos de Padrón, unos pican y otros no, which translates to “Peppers from Padrón, some are hot and some are not.” These small green members of the Capsicum genus, measuring about two inches long, make for an exciting, unpredictable dining experience. Think Russian roulette, but with spicy peppers. You’ll find them served in tapas bars around Spain. Chefs fry the green skin until it blisters, then top with a drizzle of lemon juice and flecks of coarse sea salt. Most of these have a piquant, peppery taste that’s pretty mild, with a slight grassy or nutty finish. But if you’re lucky—or unlucky depending on your heat tolerance—you may get the one spicy pepper in 10 that can burn as much as biting into a jalapeño. Legend has it that these unpredictable lime-green peppers made their way from South America to Galicia in northwestern Spain with a group of 16th-century Franciscan monks. They cultivated the seeds on the their monastery grounds in Herbón, near the town of Padrón. Thanks to the cooler environment, high levels of rainfall, and the monks’ selection of particular seeds, the peppers evolved into a strain that’s different from their Latin American ancestors. So what makes some of these green firecrackers spicy? The heat level apparently increases the longer the peppers stay on the bush, or shows up in peppers that receive more light and water. But there is no way of telling whether a pepper will be hot or not short of actually tasting it. Although pimientos de padrón are usually served as finger food, you can spice up your pizzas, salads, soups, and rice dishes with these unpredictable peppers. They go really well with cream-based sauces or with aged Spanish cheeses such as manchego. Sometimes they can even be pickled or preserved. If you want to get into the true festive spirit, head up north to their birthplace in Herbón on the first Saturday of August to join the pepper party at the Fiesta del Pimiento to try them for yourself. The festivities can be difficult to find, so just ask around and follow the music if you hear it. Some Galicians consider this the best Galician restaurant you'll find outside of Galicia. Germans turn up for a rare, pointed cabbage. Armenian monks at an island monastery in the Venetian Lagoon make a rare rose petal jam. A roadside diner in Hatch, New Mexico, makes the most of the town's fiery crop. The nut goes from oak tree to savory, sesame-topped side in a matter of days. This is Siberia's sashimi, a simple delicacy born in one of the world’s coldest climes. Presidents and popes loved this cocaine-infused wine.